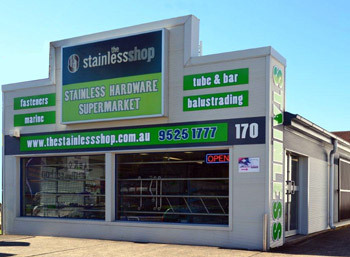 The Stainless Shop was established in 1995, operating from our retail premises at Taren Point, Sydney. We have the largest range of stainless steel fasteners on the shelf in Australia. We also carry a huge range of marine hardware, ballustrading supplies & stainless steel bar, tube & pipe fittings. At The Stainless Shop we have a "no problem" attitude, same day shipping and carry an extensive range of items at very competitive prices and specialise in finding the unusual or hard to get fasteners. Having owned and operated Honda, Yamaha, Suzuki, Kawasaki and Husqvana motorcycle & personal watercraft dealerships from 1972 through to 1993, coupled with vintage motorcycle restorations we have a good knowledge and understanding of most things mechanical. We are also keen "boaties" and have been involved with boats for 40+ years. We can give advice regarding most situations on the marine side of things. We have many years experience in the industry, with one of our staff members having been "in the business" since 1978, so don't hesitate to ask any questions you may have regarding anything Stainless. We pride ourselves as being prepared to take the time to help our customers with sensible advice regarding any Stainless Steel fastener problems.